Hydrospace brings 15 years experience in the design, fabrication and certification of acrylic windows for hyperbarics and use in Pressure Vessels for Human Occupancy (PVHO). Offering a full range of engineering services with expert knowledge of PVHO certification, Hydrospace serves all ASME-PVHO applications. Hydrospace fabricates superior quality acrylic viewports for hyperbaric chambers, diving systems, and submersible vehicles, applying the optimum in quality assurance and precision in fabrication to meet and exceed requirements of ASME PVHO-1 and ASME section VIII. In addition to manufacturing, we offer testing & repair of PVHO and Non-Standard windows. From design and fabrication to repair and hydrostatic pressure testing, Hydrospace services all types of Standard PVHO viewports and Non-Standard windows. This includes a full array of certification and classification inspections for classed view ports to meet requirements for American Bureau of Shipping (ABS), GL, Lloyds, Register, DNV, U.S. Coast Guard, and CISR. Hydro Testing: We are equipped with state of the art hydrostatic pressure testing equipment to handle any pneumatic testing or hydro test requirements. We can create a pressure vessel design and pressure tank to handle any window design pressure and temperature. Our pressure tanks can handle any geometry and mostly and size acrylic plexiglass. What is hydrostatic pressure? The pressure exerted by a fluid at equilibrium at a given point withing the fluid, due to the force of gravity. Hydrostatic pressure increases in proportion to depth measured from the surface because of the increasing weight of fluid exerting downward force from above. Hydro testing differs from pneumatic testing in that a hydro test involves liquid, where as a pneumatic pressure test involves air or compressed gas. Hyperbaric Treatment: We serve any hyperbaric oxygen chamber used for medical, diving, testing, and other applications. The chambers we serve help provide hyperbaric oxygen therapy (HBOT) for many patients in need. 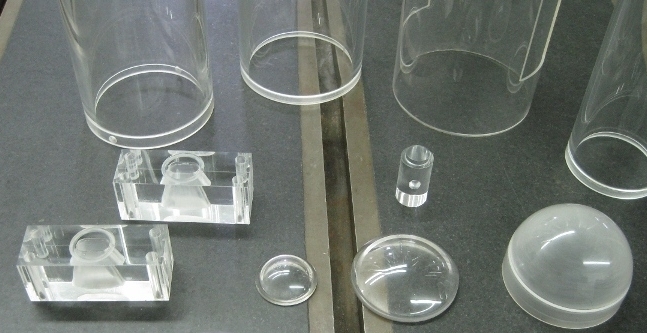 Our acrylics for hyperbarics and hypobarics are unmatched and we can help with your monoplace, multiplace, or other hyperbaric window needs. We will also help refurbish and re-certify your hyperbaric oxygen chamber in use or hyperbaric chamber for sale. Decompression vs. Recompression chambers: A decompression chamber (hyperbaric) window will take internal pressure and is used to treat decompression sickness and other medical needs. This process used in a hyperbaric chamber also known as a dive chamber involves an increase in atmospheric pressure within the chamber. A recompression chamber (hypobaric) window will take external pressure and is also known as an altitude chamber and is used in high altitude treatment. This process used in a hypobaric chamber involves a decrease in atmospheric pressure within the chamber, thus making the pressure relatively smaller than outside the chamber, which is what causes external pressure. Our PVHO acrylic windows will serve any hyperbaric or hypobaric chamber needs. Submersibles: We will create a custom solution for any pressure vessel requirement. We will help with your submarin, ROV, AUV, or any other underwater vehicle or pressure vessel concept. This can be as small as consulting Hydrospace on your design to a complete turnkey solution to your pressure vessel design. We can determine the ncessary geometry and thickness for your acrylic or sapphire windows to handle whatever window design pressure and temperature your application needs. Navigate the slide show or hover over "PVHO Windows" in the top bar to find out more.